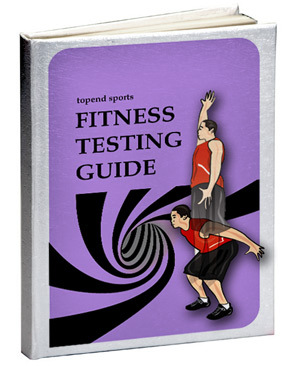 The Topend Sports' 'Fitness Testing Guide' is a free ebook that is great resource for athletes, coaches, teachers, parents, personal trainers and exercise physiologists—anyone who needs to evaluate their own or someone else's fitness level, or to gain a greater understanding of tests that they have performed. Submitting your email will also subscribe you (100% free) to the Topend Sports newsletter, containing top breaking news in sport, science, fitness and nutrition. Don't worry, you can easily unsubscribe at any time, but I don't think you will want to. As well as great information, you will get more freebies and other great offers! There are hundreds of standard fitness tests in use around the world, and hundreds more variations of these. They can range from elaborate and expensive laboratory tests to simple and inexpensive field tests. To do a fitness test it is not just a matter of reading the description of the test on this site. There are many things to consider before, during and after testing to ensure that meaningful results are achieved. Each test has many advantages and disadvantages that can ultimately determine which is the most appropriate test to perform. If you are designing your own fitness testing regime, with the information about the relative merits and requirements of each test that is contained in this guide, you can make an informed choice of the most appropriate test or tests to use. 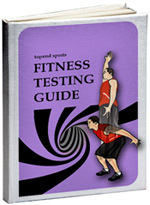 You can use the link above to download the full fitness testing guide for free. You can also find most of the information contained in the guide on this site. Firstly this guide discusses why we should perform fitness testing and the benefits of testing, then how to select appropriate fitness tests, some tips about conducting tests, and how to interpret the results. Once you have a good understanding of the issues concerning fitness testing, you can go and explore the growing list of tests and their descriptions on this site. >> continue to Why Test?